The following is a guest post by Nicklas Timberlake, a student volunteer with the Student Alumni Association. At the Chi Omega Greek Theater on Friday, October 30, the 2010 Homecoming Pep Rally the night before the Arkansas Razorbacks football game against the Vanderbilt Commodores was electric. After students from residence halls, fraternities and sororities filed into the theater, roll call began. As each name was called, the representative students roared, threw powder into the air and beat pool noodles together. At one point, a cloud of cardinal red and white balloons emerged from the crowd and floated into the 39 degree night sky. This pep rally was a small representation of the intensity that fills Donald W. Reynolds Razorback Stadium each Saturday. Relive the 2010 Homecoming Pep Rally by watching it on demand thanks to UATV. After roll call, the band filed onto the theater stage and the drumline began tapping. At this point, fans young and old could not resist the urge to boogie, and the baton twirler began her daring performance including two flaming batons. The band continued to cycle through their playlist for a while, ending with the school fight song. This portion of the pep rally then ended appropriately with Calling the Hogs. After the four homecoming judges were introduced, the reigning Homecoming Queen Kim Smith and her father, who escorted her, took the stage to appropriately pass down the reins. Homecoming candidates Kate Chapman, Hannah Henson, Whitney Jones, Claurece Montgomery and Ashley Shelton then were introduced. After an ovation for the candidates, Athletic Director Jeff Long took the stage to announce the winner. After stating his appreciation to the students, Long opened the all-important envelope and revealed to the attendees that by popular vote the 2010 Homecoming Queen was Hannah Henson. The pom squad followed by completing a very complicated synchronized performance brilliantly. The band then played a few more songs as students and alumni wearing everything from cowboy hats to swim trunks danced along. The final portion of the pep rally consisted of a trivia challenge between students and faculty. The faculty ultimately won on the question “When was the University of Arkansas established?” causing the majority of the theater to moan in disappointment. Check out our Pep Rally Photos on Flickr. The band, students and alumni continued with a call unto Old Main and the Hogs followed by the announcement of the winners of the Pep Rally. For the residence halls, Maple Hill West and South received the third-place trophy. Maple Hill East received second place. And the Northwest Quads were the champions. In the sorority branch, Kappa Kappa Gamma received the third-place trophy with Tri Delta in second and Chi Omega as champions. The 2010 Homecoming pep rally was a complete success. 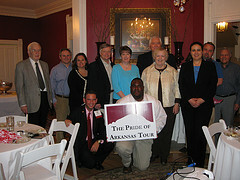 Many Arkansas Razorback representatives from near and far and from past and present were in attendance and the intense Razorback pride shared by all was very apparent. On this brisk Friday night, Calling the Hogs became so loud that it could, without a doubt, be heard ‘round the world.